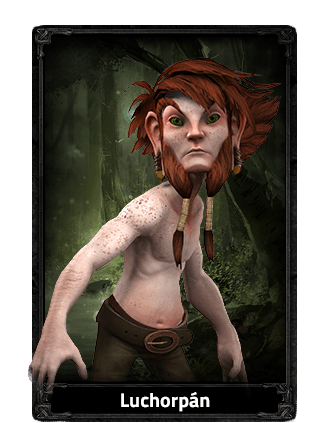 Luchorpán is a playable Races in Camelot Unchained. Small and often underestimated, the Luchorpán are natural-born tricksters, masters of misdirection and illusion. They believe that lies can reveal the truth, that a person’s hidden nature is revealed when they are the victim of a prank. The clever fingers of the Luchorpán are naturally skilled at powerful crafting, and their quick reflexes, excellent hiding skills, or talent for climbing often get them out of whatever trouble their mischief gets them into. If all else fails, rumor holds that Luchorpán can simply vanish and reappear elsewhere. Bonds of love are considered unbreakable among the Luchorpán, and any of them would give up life itself to defend their family or their Realm.